Organized and led by Akeem Ayanniyi, resident of Santa Fe and 9th generation traditional drummer from Oshogbo, Nigeria. 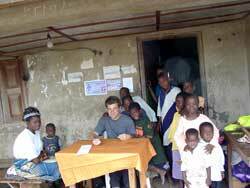 Akeem will lead a group of interested people to his village of Erin Osun and neighboring city of Oshogbo. He is remarkably qualified as leader of the tour, as he is bilingual and bi-cultural, having divided his time between Nigeria and America for the past decade. Akeem began leading and organizing tours officially in 1997. He is a master drummer, well known to Santa Fe, and has also performed around the USA and Canada, including New York, Boston, Detroit, Chicago, Texas, San Francisco, and Calgary, Canada. 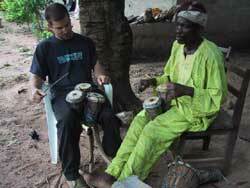 As a master drummer, he is also intimately connected with West African dance. Drumming and dance workshops will be conducted by the Iyaloja Heritage Drum and Dance Association of Erin Osun which is comprised of members of the Iyaloja clan of traditional drummers - they number approximately 200 people, to which Akeems family belongs. Classes will be organized daily at two hourly stretches, in the morning and evening. There will be classes arranged in drumming, dancing, and song. There will be time allowed for extra curricular activities. 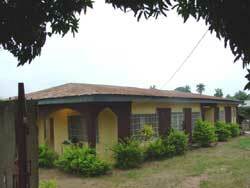 Most of the workshops will be conducted in the peaceful village environment of Erin Osun and Ofatedo. Participants may bring their own drums or arrange to purchase one in Nigeria. Other activities including night life will take place in the larger city of Oshogbo, which is the largest city of Osun state and situated inland in the southwest of Nigeria, directly north of Lagos. 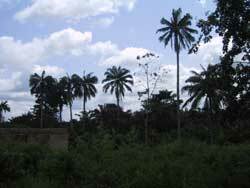 Oshogbo lies between the villages of Erin Osun and Ofatedo. 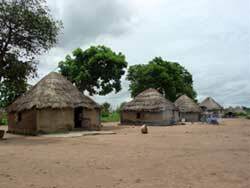 It is considered the cultural capital of the Yoruba tribe which is the most populous of the three main tribes found in Nigeria. Yoruba is the language of the people in this part of Nigeria, though English is commonly known and remains the language of government. Here is located the internationally known Nike Center for the Arts. Many of the artists who have trained there are known in Santa Fe for their magnificent batiks and other crafts. There will be opportunities for guests to try their skill at batik making, ceramics, wood carving, sculpture, among the vast array of arts in progress there. Visitors will be accommodated in the modern house that Akeems family has built outside Oshogbo in the village of Ofatedo. The house includes electricity and running water. Beds will be provided, but guests should bring their own linen. Windows are fitted with wire screens. Food will be included in the accommodation. The staple diet consists of yam, rice, beans, and chile stew. Vegetables and fruits are available and arrangements can be made for vegetarians. Bottled water will be available at all times. We are planning to leave in March/August of 2012/13. This should be an excellent time to find bargain travel rates. Guests may plan to stay for part of the month, the whole month, or even longer. Individual schedules should be arranged with Akeem. We shall arrange for group rates if participants are able to travel at the same time. Wings Travel has provided excellent rates and service in the past. We shall leave Albuquerque and fly to Lagos where we shall be met by members of the Iyaloja Association and transported to Ofatedo via van. After an initial deposit indicating positive intention to participate, Iyaloja Association will write and sign visa applications which must then be sent to the Nigerian embassy in New York together with your passports. The embassy will stamp the passports and return them via pre-paid registered mail. Sufficient time must be allowed for this process, at least 4 weeks before travel. It is essential to be vaccinated for yellow fever for entry into Nigeria, and a record of the vaccination should be entered into an official Certificate of Vaccination. It is recommended that travelers consult their own physicians or the travel clinics available through health organizations for further information regarding immunization and other health precautions for travel to Nigeria. At this time of the year, the climate is warm, rainy and humid. Light clothing is recommended. A light jacket may be useful for evening. Long skirts or pants are suggested for evenings to protect from mosquitos. The local currency is Naira. The current exchange rate is approximately 150 Naira per US dollar and, is of course, subject to change. It is advisable to take cash and/or travelers checks, though cash is preferable. There are no ATM machines in Nigeria, and although credit cards may be accepted in Lagos, in other areas of Nigeria, it is a cash economy. 1631 Calle Sotero, Santa fe, N.M, 87507. Agalu African Music, Nigeria branch. Contact name is Morufu Ayantayo Ameen.